'Tis the season for a glass of bubbly—but this episode we're not talking champagne, we're talking seltzer. America is in the throes of a serious seltzer craze, with consumption of the bubbly stuff doubling in only a decade, from 2004 to 2014. But where does seltzer come from, and why is it called "seltzer," rather than simply "sparkling water"? Is there any truth to the rumors that seltzer can combat indigestion—or that it will rot our teeth? Why are all the hipsters crushing cans of LaCroix, and what's the story behind Polar's ephemeral sensation, Unicorn Kisses? Before the advent of modern medicine, people who suffered from a variety of ailments frequently knew neither the cause of their symptoms nor the treatment. As a result, various cure-alls were touted as the solutions for almost everything. One of those all-powerful medicines was the naturally carbonated water that bubbled to the surface in springs around the world, and spas sprung up where visitors could "take the waters" in order to cure everything from biliousness to nervous afflictions. As Barry Joseph, who's working on a book about the historical and cultural significance of seltzer, Seltzertopia: The Effervescent Age, told us, Niederselters in Germany was, in the 1700s, one of the best-known of these spas. The town bottled their spa water in clay jugs that they shipped around the world. In every country, the name of the drink morphed slightly, from "seltz suyu" in Turkey to "eau de seltz" in France to "seltzer" in America. In English, the name stuck. John Matthews' tomb, Green-Wood Cemetery. Photo by Nicola Twilley. In this episode of Gastropod, we trace seltzer's trajectory, aided by Joseph Priestley's discovery of a technique for artificially carbonating water, from medicine to mealtime treat. We visit New York's Green-Wood Cemetery to learn more about John Matthews, the "Soda Fountain King," who fueled nineteenth-century American's love for fizz using construction scrap from one of the world's largest Roman Catholic cathedrals. Sensory scientist Marcia Pelchat explains whether there's any science behind seltzer's health halo, and journalists Mary H. K. Choi and Steve Annear describe how long-established companies such as LaCroix and Polar have reinvented themselves to appeal to a new generation of seltzer obsessives. Pop, sip, and listen in now! Marcia Pelchat is a sensory scientist and associate member emerita of the Monell Chemical Senses Center. She is the co-author of a 2014 paper titled "Carbonation: A review of Sensory Mechanisms and Health Effects." Barry Joseph is associate director for digital learning at the American Museum of Natural History—and he's also working on a book about the history and cultural importance of seltzer water: Seltzertopia: The Effervescent Age. 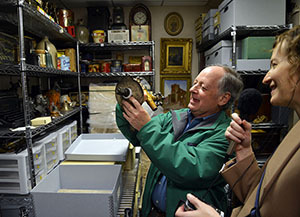 Jeff Richman and Nicky looking at parts of John Matthews' soda fountain apparatus in the Green-Wood Cemetery archives. Photo by Geoff Manaugh. Jeff Richman gave up his job as a lawyer to become the historian of Brooklyn's Green-Wood Cemetery in 2009, and he has been uncovering the stories of the 561,000 people buried there ever since. Among them is John Matthews, the "Soda Fountain King." 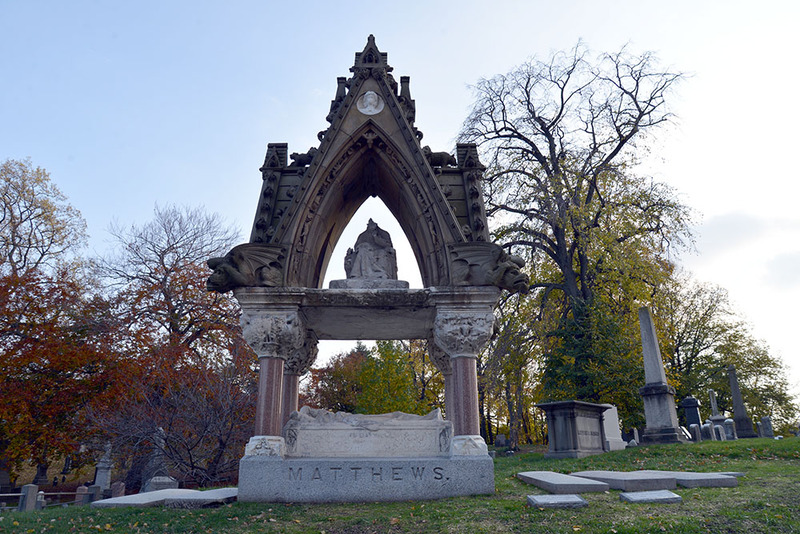 You can read Richman's posts about the Matthews monument and some of the artifacts related to Matthews that he has collected on the Green-Wood Cemetery blog. The John Matthews Soda Fountain Company catalog, complete with hot soda dispenser. Photo by Nicola Twilley. 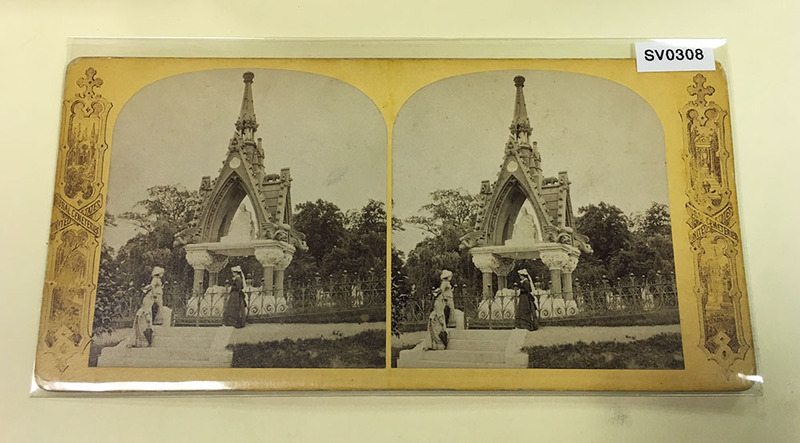 John Matthews' grave depicted as a tourist attraction in stereoscopic postcards of the time, in the collection of Green-Wood Cemetery. Photo by Nicola Twilley. Cultural correspondent Mary H. K. Choi confessed her LaCroix addiction in this New York Times article in 2015, while the Boston Globe's Steve Annear has indulged his obsession with Polar Seltzer by covering the furor over their Unicorn Kisses flavor, and by visiting their Worcester, Mass., factory for Boston Magazine. The original 1979 ad that introduced America to Perrier. Recognize that voice? It's Orson Welles. Earworm alert: this is the Sodastream jingle that embedded itself in the brains of many Brits during the 1980s. Play at your own risk. Rakeem's sublime homage to LaCroix, complete with eyebrows. Charter TV3 is a TV station based in Worcester, Mass., the home of Polar Seltzer. Libby Nelson and Javier Zarracina's article for Vox, "Why LaCroix Sparkling Water is Suddenly Everywhere," explores the secrets to LaCroix's rise, including its breakthrough vehicle: office supply websites.